How to find the best sofa bed for you! The dual functionality of sofa beds make them indispensable in spaces when there isn’t enough room for both a bed and a sofa. A sofa bed or sleeper sofa provides you with a cozy seat for lounging around during waking hours and a comfortable surface to sleep on when it’s time for bed. It’s also a great piece to have when you have a guest or two spending the night and don’t have a separate room for them. And even if you do have a guest room, you’ll never know when you’ll need more beds so it’s best to be prepared. With a sleeper sofa, you can quickly and easily convert a home office, den, rec room, basement or living room into a bedroom for guests. There are many styles, fabric types, colors, materials and sizes of sleeper sofas to choose from, so you’ll surely be able to find the best sofa bed for your needs and preferences. 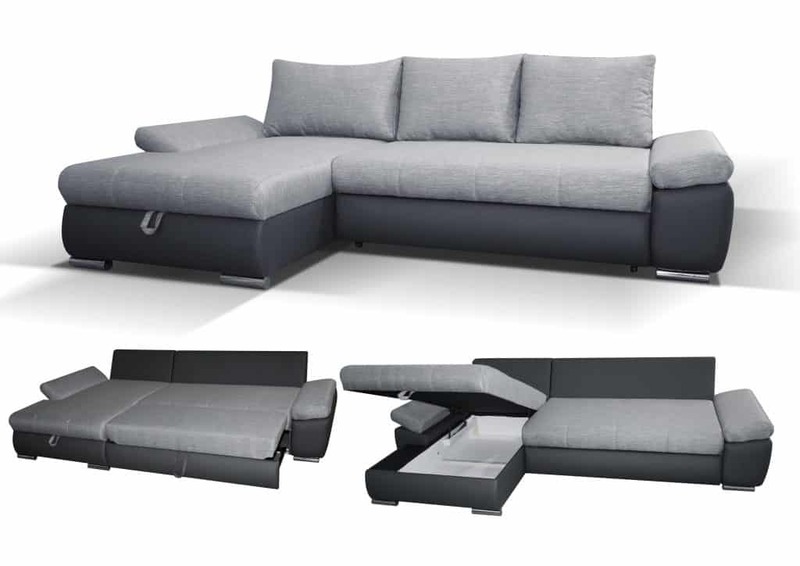 Some convertible sofas even come with built-in storage for pillows and blankets. Here are the things you need to consider when making your selection. There are different kinds of sofa beds but they come in four major styles. Pull-outs – these are the traditional sofa bed models where the top cushions are removed to reveal the bed mechanism and the mattress. The bed is then pulled out then flipped forward. Once the frame is snapped into place, the legs are extended to support the bed mattress. Futons – futons are unfolded by releasing a hinge on the seat base to become a sleeping surface, and are basically a mattress on a base that can be folded in half. You can choose from either a bifold futon or a trifold futon. Opening a bifold futon is like opening a book flat on a table – the back support and the seat base lay flat, with the mattress on top of it. A trifold futon does the same but it has a concealed deck under the seat base. This deck unfolds to become a footrest. Futons are more lightweight and portable than traditional pull-outs and are great for those on a budget. Drawer style – similar to pull-outs in that the bed mechanism is hidden under the cushions, but different in that you don’t have to remove the base cushion. With this type of sofa bed, you simply have to pull out the drawer below the sofa, place the top cushion into the drawer and adjust to fit. Corner – corner sofa beds are shaped like an L (or an L in reverse) and may have the features of pull-outs, futons and drawer-type sofa beds. Daybeds – daybeds are actually more bed than sofa – you don’t have to do any pulling out or unfolding. The width and length are similar to that of a single bed, so you can simply lie down to sleep. Clic Clac – considered the most convenient way to turn a sofa into a bed. You just need to push the back of the sofa slightly forward (or toward you when you’re sitting on the sofa) to unlatch the locking system then unfold it to flatten. Lift and Pull – in this type of sofa bed, you lift the seat up to release the lock then pull the bed out. A-Frame – to convert this sofa into a bed, you need to pull the base forward to unfold the A-shaped frame into a flat surface. Folding – these sleeper sofas are folded out in two motions and use either an innerspring or foam mattress. The internet has surely made it easy for people to look for and buy the things they want, but is buying a sofa bed online a good idea? Here are the things you need to consider when buying online or in a furniture store. Time – buying anything in a store can take up a lot of time, from choosing products to queuing up at the cashier. If you don’t have the time to physically visit different furniture shops and check out what they have, your next best option is to simply buy your sofa bed online. When you shop online, you can quickly see what’s available, take your pick and make your payment with just a few clicks or taps. You won’t have to wait for business hours either! Options – if you want to be able to choose from a wide variety of sofa bed styles, colors and materials, shopping online is the way to go. In-store, your options are limited to what the shop has in its stockroom. Comfort and feel – there’s no other way to know how a sofa bed feels than to test it yourself, something that can only be done when you shop in a store. This is important especially if you would be using the sofa bed yourself as your main bed. When you buy online, you would have to rely on product reviews and videos to gauge how soft or comfortable a sofa bed is. Demos – some sofa beds are easy enough to convert into a bed, but some others may have an operating mechanism that would be best demonstrated in your presence. If you want to see how a sofa converts into a bed and try doing it yourself, then it would be ideal to go to a store, where a salesperson can show you how it’s done. Online, there are demo videos you can watch but there’s really nothing like being able to try the operating mechanisms out yourself before you buy. Price – when you compare prices, you’ll notice that sofa beds sold online are usually cheaper than those sold in physical stores.This is because it costs less to operate an online store. So if you want to save money on a sofa bed – without having to negotiate with salespeople, wait for furniture clearance sales or go to outlet stores – you can simply shop online. You can also use discount coupons or promo codes for instant savings! Different types of sofa beds make use of different kinds of mattresses or cushioning. When choosing the best sofa bed for your needs, you need to consider what it will be primarily used for. If your intent is to use it as your daily sleeper and therefore for long-term and regular use, then it should be something that you find comfortable, with just the right support and pressure point relief for the lower back, hips and shoulders. It is important to note that sofa bed mattresses tend to be thinner than an actual bed mattress, so if you are planning on using the sofa bed as your main bed, then you need to consider padding it up with a mattress topper for added comfort and support. Sofa beds come in a variety of sizes, from compact, space-saving futons to bigger corner sleeper sofas that can accommodate up to three people. When making your selection, you should consider how much space you have for the sofa bed. Take a look at the dimensions of the sofa bed when it’s in sleeping position so you can be sure it can open fully and really function as a bed. If space is not an issue, then you can go for the larger sizes, which allow for more room to stretch and move around. Sofa beds come in a wide variety of materials from cotton to leather, and constructed using wood or metal frames along with several components that make up the operating mechanism. Whichever type of sofa bed you choose, you need to make sure that it’s made of quality materials and has a sturdy construction to make sure it can stand the test of time. It is especially important to check the strength of the sofa bed frame. The frame serves as the sofa bed’s skeleton so it’s crucial that it’s made from a tough and durable material that can support the weight of the bed or mattress and the person (or persons) sleeping on it. The overall quality and construction of the sofa bed should be top-notch so it doesn’t break or give way with just a few uses. A sofa bed shouldn’t make it difficult for you to get a comfortable night’s sleep, so it should be easy to transform from a seat to a bed. The best sofa bed is something that you can quickly turn into a bed and back into a sofa without having to use additional tools or a lot of physical effort that can result in injury. Good customer service is invaluable when you have questions regarding a sofa bed or encounter issues with your purchase. A company that provides 24/7 customer service will be able to sort things out and assist you promptly, especially in a situation where you may have trouble with the operating mechanism or need to have the item replaced. Product reviews are a great source of information about a sofa bed’s quality and ease of use. Reading reviews can help you determine whether a particular sofa bed has everything you’re looking for or if it wouldn’t be a good fit considering your personal preferences. Reviews can be made by people who specialize in making in-depth assessments of the different aspects of a sofa bed, including the operating mechanism, materials used, frame type, mattress thickness and comfort, price and the like. Sofa bed reviews can also come from people who bought the same product and may include comments about delivery time, customer service, any problems encountered with the operating mechanism and so on. Return and exchange policies for sofa beds vary depending on the manufacturer. Some brands allow customers to return or exchange an item within three to 14 days of purchase, while others have a longer return period. Whatever the terms are, it shouldn’t be a challenge to undergo the process of returning or replacing your sofa bed. Note that in many cases, special orders or custom items (where the size, color and fabric type are specified by the customer) are non-refundable. Always read and understand the fine print – you may need to pay for pickup, delivery and restocking fees. If you have any questions, don’t hesitate to contact the company’s customer service department. Sofa bed warranties vary according to the type of the sofa bed and the manufacturer. For instance, a sofa bed may come with a 10-year guarantee for the frame only. This means that the warranty does not include the sofa bed mattress or cover. Some manufacturers offer a lifetime warranty for the frame and the seating suspension. Warranties usually just cover manufacturing defects and faulty components, such as wobbly parts in a drawer mechanism or a folding section that won’t open fully. Many manufacturers provide repairs that are free of charge up to a year from the date of delivery. Warranty coverage usually doesn’t apply to sofa beds that have been stained or soiled, altered, intentionally misused or damaged in a way that did not result from manufacturing defects. The best sofa bed for your needs should be the one that fits your budget while providing you with everything you need in a sofa bed. It’s the one that offers the best in terms of comfort, ease of use and durability while costing the least. Whether you’re buying a sofa bed online or in a store, you should take these factors into consideration to help you decide on which model to choose or brand to purchase from. If you’re not in a hurry to buy a sofa bed, you can visit furniture stores to check out the operating mechanisms and the feel of different sofa bed models yourself. This will help you narrow down your options. You can then choose to purchase the sofa bed online and apply discount codes toward your purchase for bigger savings and a greater value for money.